Looking for the best toddler carriers? “Baby” wearing isn’t only for infants! If you’re reading this page, chances are you already know that a supportive carrier can come in handy, even well after your toddler is walking. Yes, your toddler *can* walk but that doesn’t mean she *will* walk. And it certainly doesn’t mean she will walk in the direction you want or with the speed you need. Even the sturdiest kids sometimes get tired and need to be carried for a while. Any parent who has tried to hike with a young child knows a trail your child easily completes one day can seem an insurmountable struggle the next! 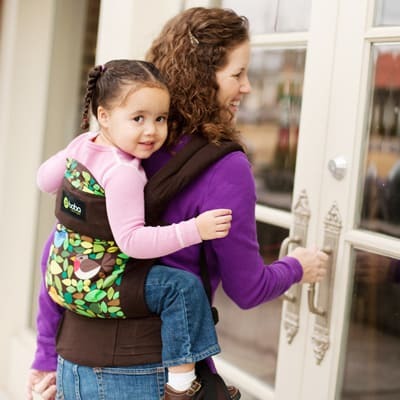 Note: Most of the child carriers we offer here at Carry Me Away are appropriate for children up to 35 lbs (with the exception of stretchy wraps like the Moby and Wrapsody Water Wrap). So, if you already have a carrier that is working for you, by all means, hang on to it! If you are buying exclusively for a toddler or an older child, however, here are our favorite toddler carriers for older children. We recommend having two toddler carriers – both a supportive ring sling for quick on/off plus a wrap or a buckle carrier for longer, more supportive carries. Maya Tai meh dai carriers - wide wrap-straps and premium woven fabrics offer a gorgeous baby carrying experience! Double layer of linen offers great support and is wonderful for hot weather! Tula Ring Slings combine the strength and beauty of Tula Woven wraps with the ease of use of a ring sling.